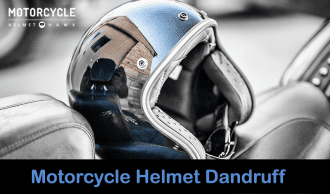 Home / Best Motorcycle Helmet Locks – How to Lock a Motorcycle Helmet? 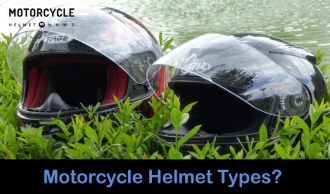 Best Motorcycle Helmet Locks – How to Lock a Motorcycle Helmet? 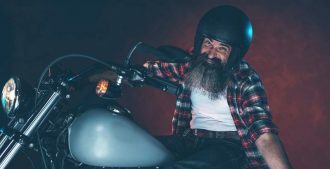 Every motorcycle rider can tell you that they really value their bike because it helps them to move from one point to another. 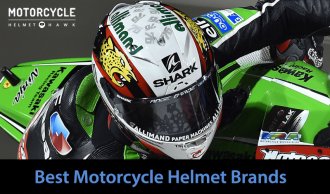 Besides that, their helmet is equally important because it keeps the rider safe from fatal head injuries. If you leave your bike an attended for long, thieves will come looking for anything valuable. 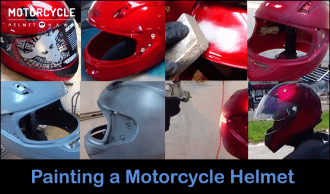 Since it’s not easy for the entire motorcycle to be stolen, the thieves focus on helmets. And it’s very annoying to have your premium helmet stolen when you know how much you paid for it. 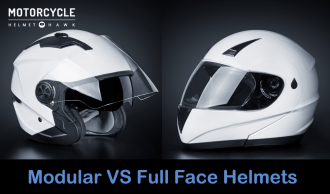 Some helmets cost as much as $800. Now imagine how you would feel if you came to your bike and found such a helmet missing. You would go mad but can’t bring it back because it has already been sold somewhere probably to another unsuspecting rider. 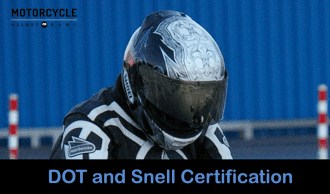 There are two solutions that can help in keeping your helmet safe from thieves. You either carry it to wherever you’re going, or buy a padlock for fastening it on the bike. Carrying the helmet all the time has and will never be cool. Assuming you want to shop for a few things at your local convenience store, how will you carry your stuff if one hand is already preoccupied with holding the helmet? On the other hand, a helmet padlock gives you peace of mind because any thief that wants to steal it must first deal with the obstacle and by the time they’re done you will be back. The best way of locking your helmet is fastening it using a padlock around the handles of the bike. There are various types of helmet padlocks in the market. There are those that resemble the usual padlocks that are used to lock doors at home and others that come with strong straps. 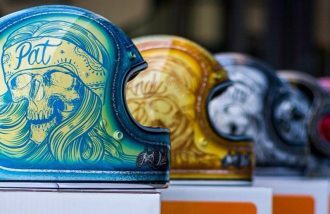 Here is a list of the best helmet brands that we checked out. 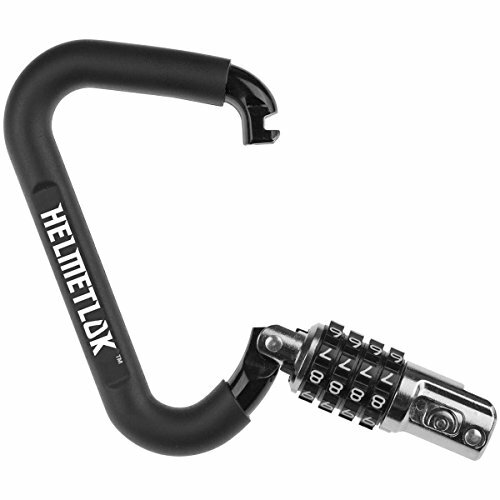 Helmetlok 4101 Carabiner Style Helmet Lock comes with a compact design. It’s not fixed on the bike permanently which gives you the freedom to take it with you whenever you’re travelling. The lock is shaped like a shackle so that you can mount it on any part of the bike. The lock is constructed from zinc alloy. 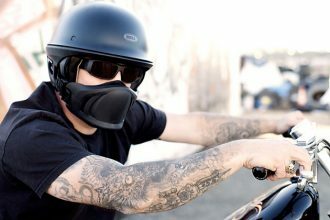 The good thing is that it can’t wear out the helmet because it has a rubber coating. The lock is closed and opened using a combination of any four digits. You can reset the digits any time you want. Other than the helmet, the lock can be used on other accessories. 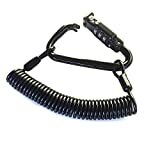 Lockstraps 901 Helmet lock is fitted with a nylon strap that is 2 feet long. The lock can therefore be used to lock many things at a go. You can therefore lock the helmet at the front or the back together with your luggage. The strap is strong to withstand any kind of punishment which means it’s not easy to cut it. 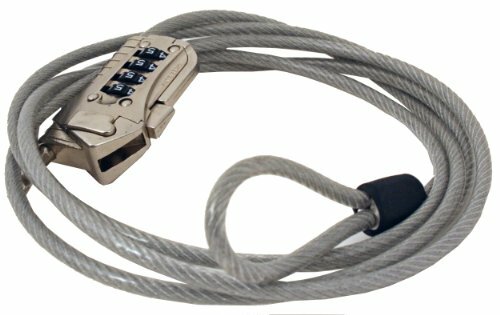 The FJM SX-635 is basically a lock that has a long rope and a locking mechanism. 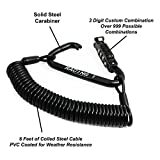 The rope has a length of 79 inches and is 2000mm thick, which means it’s very durable in the long run. The locking system is closed and opened by combining a set of digits. If you don’t get the code right, the lock remains closed. The lock therefore helps in keeping thieves at bay because they can’t steal your motorcycle helmet. Additionally, the rope enables you to lock several items alongside the helmet. The lock has a loop on one end that’s reserved for bigger luggage. 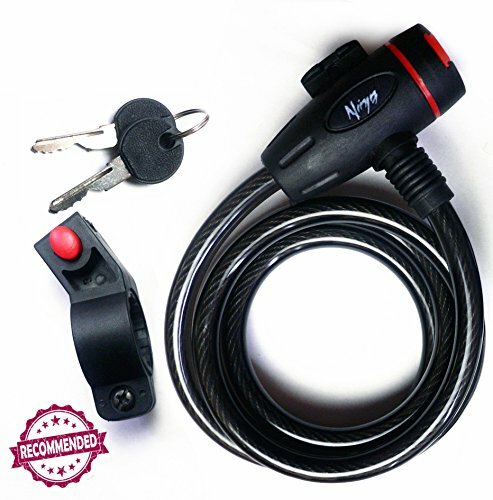 Ninja Bike Helmet Lock has a cord for fastening the helmet and other items such as a jacket and gloves among many others. The cord is very flexible because it measures 3.4 feet long. The length is enough to fasten two helmets. You can use the lock on different bikes because it’s highly portable. The locking mechanism is opened and closed using keys. 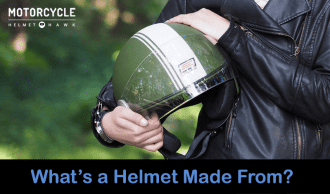 HelmetSecure Classic Helmet Lock is designed to be permanently mounted on the motorcycle. This means that you can not use it on a different bike. 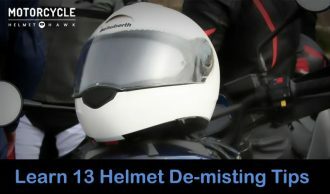 The lock fastens the helmet by looping it through the hole of the D-ring. Besides that, you can also fasten it through the face shield and the chin bar. The lock comes with a 15 inch cable that makes it easy to hook up your helmet. The helmet is rust free because it’s coated with chrome finish. 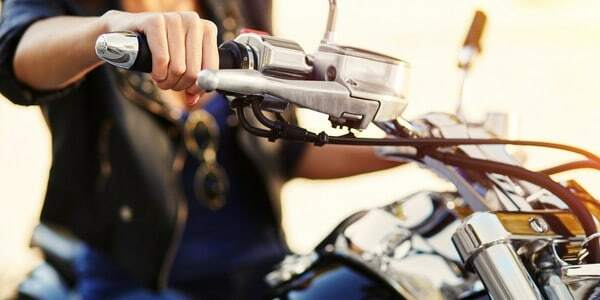 Once you have installed the lock on the bike using the provided screws, it’s not easy for thieves to detach it due to the fact that the screws are not visible. The lock can only be opened using keys. EASY TO CARRY- Small & Light (5cm x 9cm) to easily tuck into your pocket and carry around. RESSETTABLE: Easy to set your own personalized number combination. Over 999 possible combinations.